4 categories: See the questions in a separate Times breakdown here. 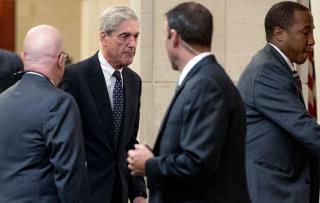 They fall into four categories, regarding Michael Flynn (and whether Trump obstructed justice to try to protect him), James Comey (and whether Trump fired him to protect others), Jeff Sessions (and whether Trump "views law enforcement officials as protectors," per the Times), and the Trump campaign's alleged coordination with Russia (with a focus on the 2016 meeting at Trump Tower). Examples: "What did you know about phone calls that Mr. Flynn made with the Russian ambassador, Sergey I. Kislyak, in late December 2016?" "What was the purpose of your Jan. 27, 2017, dinner with Mr. Comey, and what was said?" "When did you become aware of the Trump Tower meeting?" When FBI starts firing off questions at Trump, the poor fella will squirm like mad, stumble over his words, sheet in his pants and pass the fk out. Manafort went to work for trumpita FOR FREE. Trumpita is so stupid he thought that was a normal thing. Trump has been forever trying to portray Mueller into a narrative and this is simply one more attempt. These arent actual Muellers question. These are massaged questions generated by Trumps, team to mold public sentiment. Generating a narrative, attributing actions and intend to someone who hasn’t said anything.